The Toyota Camry quietly debuted late in the 1983 model year, when Toyota replaced its old rear-wheel-drive Corona with the front-wheel-drive Camry, a car aimed specifically at the U.S. market. From these humble beginnings, the Camry would go on to dominate the midsize family sedan segment for virtually all of the next quarter-century, as consumers immediately embraced it for its high build quality, comfortable ride and impressive durability. 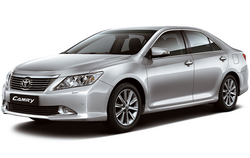 Here you can find Toyota Camry owners and service manuals and other information of car.